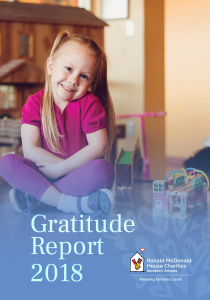 The 2018 Gratitude Report is here! This quick read will show you how your gifts in 2017 helped to keep families closer together. Read the interactive digital version by visiting the Online Gratitude Report or stop by the House for a paper copy. This is just one of the ways you can learn about your personal impact on RMHC families. Be sure to follow on Facebook and Instagram or sign up for the once-a-month newsletter.